It isn’t necessarily about asking “Is this organic?” but about asking “How do you grow/create this food?”– because the answer isn’t a simple yes or no. 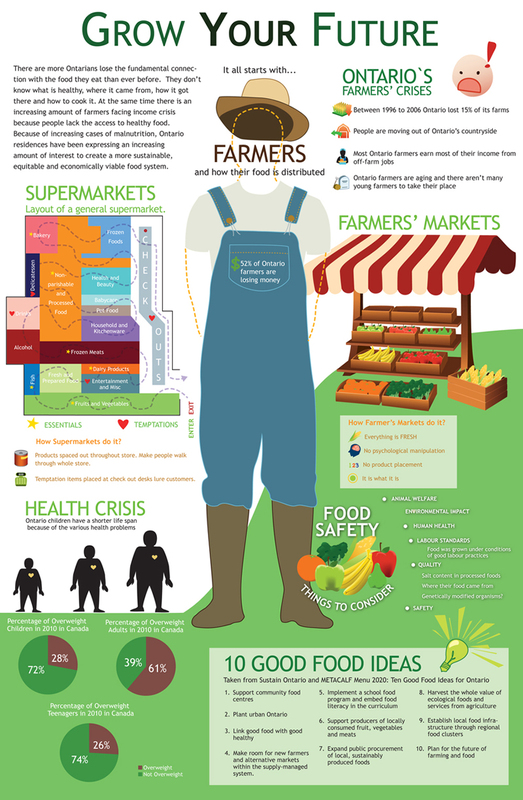 This infographic by Sustain Ontario says a lot about why we are passionate about supporting our precious Ontario farmers & food artisans. In ten short years Ontario lost 15% of its’ farmers. In addition to providing quality goods, local agriculture preserves farmland, keeps money in the community and reduces greenhouse gas emissions related to food production and transportation. We believe it is important to understand our food system so that we can work towards positively influencing it. Simply put, our current food system that transports globally produced year round, fairly cheaply, does so by encouraging the use of chemicals to control weeds/pests instead of the more labour-and space-intensive ecological options. Or through packing animals into overwhelmingly crowded spaces and feeding them growth antibiotics. The cost of this cheap food impacts food safety, consumer health, increases the use of antibiotics, and causes water pollution and soil contamination. This is why every week we are excited to have an abundance of Ontario farmers and producers selling the fruits of their labour in Cabbagetown. Some are certified organic, some are biodynamic producers, some are revitalizing previously fallow land. 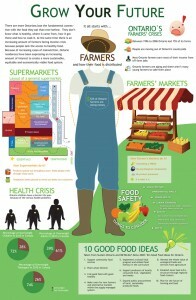 There are many types of ecological farming practices. We hope that you enjoy supporting local growers & producers and positively impacting a more sustainable food system. Next time you are at the market ask a vendor what their growing practice is or what they think about a more local food system & its impacts. There are many great online & published resources that more deeply explore these topics. Some great resources are: Toronto Food Policy Council, Food Secure Canada, Raj Patel, Michael Pollan, No Nonsense Guide to World Food (by Wayne Roberts) and Vandana Shiva.